People who eat (and that pretty much sums up everyone) tend to fall into two camps.Those who painstakingly enjoy one item from their plate at a time (aka, the Serial Separators), and those who fuse everything together into one mouthwatering mountain of flavour (aka, the Mix ’N Munchers). The Serial Separator is a purist, and likes his food as such. The Separator is a skilled forks-man – pushing each item aside, so they don’t dare touch other items, in order for each bite to be as pure and as uncompromising as the next. For Mix ’N Munchers, it’s all about efficiency and excessiveness – especially on the flavour front. Spinning and twirling all the ingredients together into a non-scripted mess of deliciousness. Whichever camp you fall under, we’ve got you covered with our new (and aptly named) Modern Bowl. We’ve conveniently selected the ideal flavours and ingredients you need to make your eating experience ideal. All you need to do is separate or mix as you wish. Add grilled chicken. Add glazed salmon. 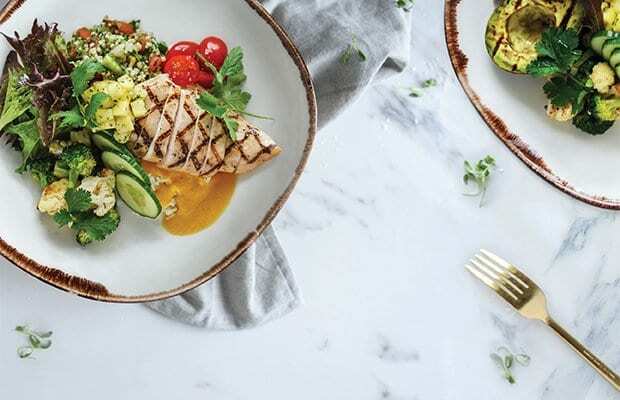 And if you’re a vegetarian (or in a vegetarian state-of-mind), add grilled avocado to the bowl’s 11 healthy fruits and vegetables (including roasted cauliflower and broccoli, cucumber and tomato – plus rice topped with carrot ginger sauce). With our Modern Bowl, the choice of what you eat and how you eat it is entirely up to you. We figure it’s the modern way to bowl.